For the splendid struggling mothers of Southwark and their children. "The splendid struggling mothers..." is surely a quote from something, perhaps written by Geraldine Mary at the time the Park was being proposed/opened? 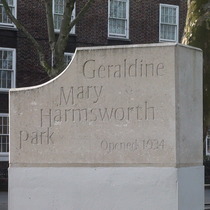 The carved lettering have a rather modern feel and the stonework looks newish so we think it likely that this entrance was restored as part of the 75th anniversary clean-up of the park. "splendid struggling mothers of Southwark and their children"